Today Facebook and Twitter has been a massive hit to promote your blogs socially gaining traffic and readers. This post will tackle on how you can create an automatic feed push from your blogs to your Facebook fan page or profile. We will be focusing on Twitter on my next post. Apparently if you’re single-handed maintaining 3 to 4 blogs of your own this could be a headache to interfere daily to your readers through Facebook, so the practical ways is to add an application to your account to push your blog posts to your Facebook profile wall. 2. Allow NetworkedBlogs application by going to this link. 3. After you allow the app, click “Profile” (see below) and modified it to have your details. 4. At the bottom of your NetworkedBlogs profile click “Add your blog” or simply click this link. 5. Then accomplish the form with your blog details. First, add your blog to our directory so others can find it. Visit the app’s home page and click on “+ Add a New Blog”. Import your feed and push it to the stream for all your friends and fans to see. This is one of the best ways to promote your blog. Make sure your posts show on your wall and in the news feed of your friends and fans. NetworkedBlogs provides several options to do that. On your blog page, click “feed settings” to enable this feature. And if you have a Facebook page, you can use this feature too through your page’s ‘edit page’ menu. Invite your friends to follow your blogs. Your friends most likely want to follow your news and read what you write. On yor blog page, click “invite friends to follow”. Do that from your Facebook profile page as shown below. Visit your NetworkedBlogs profile page and click on “Add to Profile” and “Add to Info” as shown below. 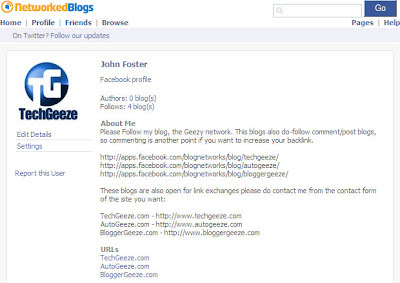 Add the NetworkedBlogs widget to your blog. The widget will allow your readers to follow your blog directly from your blog. Use the news reader on the app’s home page. Use it to find the latest news, and make sure to vote the good posts up. When you vote on a post, your picture will show next to that post for everyone else to see. You help the best posts get exposure, and people tend to click on pictures of those who recommend good articles to see what else they’re up to and might choose to follow your blog as well. After you optimized all the possible NetworkedBlogs functionalities, you will find that the the application really works goods. Besides from the fact that it lies on Facebook, lot’s of opportunity for traffic since the application attracts 500 new blogs addition per day (as of now). So gathering followers and networks will be truly fruitful in the end. One thing I must say that’s good with the application feed push is that, –it acts as external link (it jumps to your own site meaning traffic), compare to internal “Notes” app on Facebook that jumps only on feed imported on the application (no traffic). Meanwhile, you can visit my pages to see the implementation and if you want try to subscribe or follow it or even become my fans. Hopefully this tutorial works for you again, let me know if you have problems implementing this just drop a comment on the comment form and I’ll try my best to help you. Thank you for this tip. This is perfect especially if you want to promote your blog in other platforms. This will help you market your blog to all your contacts on facebook who will visit your profile page. Thanks for post, i like internet and web site tips usefull for me as this blog. I am bookmarking it. Facebook is very very good on using internet users. Very great article that is very interesting. Thanks bro for the information. Most dofollow blogs use the wordpress plugin Akismet which automatically filters most spammy comments. Unfortunately I don't this you can use this on a site hosted by blogger. Wonderful post, and great writing style thanks. it acts as external link (it jumps to your own site meaning traffic), compare to internal “Notes” app on Facebook that jumps only on feed imported on the application (no traffic). After you optimized all the possible NetworkedBlogs functionalities, you will find that the the application really works goods. Thank you for sharing this info, it really came in handy. I have learned so much here, am glad to be a member of this community. thanks after looking in vein everywhere how to do the rss. I used this network blogs pluggin and really drives traffic to my blog…it is really an amazing tool!! I been using it actually for more than a year. I like this type of social networking site and also provide good information to how to join and create new account for face book.Face book is very nice for blogging and social networking for company. Here , The best information about social networking site.I like to use face book for some social work.This one is best for generate traffic on Internet server. I have installed this application and it did help generate traffic to my blog. A personal blog, though! I have installed it and its working really great.